This is one of my favorite brushes! I use it to apply my Bare Minerals foundation. It blends flawlessly and leaves my skin with an airbrushed finish. 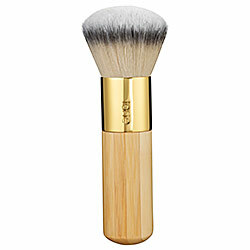 I find that using this brush allows for excellent coverage over any blemishes and skin imperfections. The bristles on this brush are super soft…they are not at all coarse or stiff. I’ve had this brush for well over a year and clean it on a regular basis and it never sheds and seems to be holding up well and is in nearly the same condition it was when I received it.